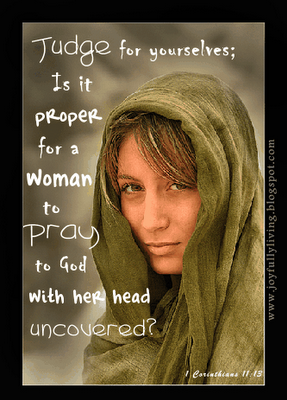 1 Corinthians 11:1-16, is entitled, Head Covering. When I read that women used to wear a symbol of authority on their heads while praying, (interacting with God) or prophesying, (speaking God’s Word) I couldn’t shake the question, why did we stop this ancient custom? I spent many nights reading opposing views on this topic. Back and forth I went, like a wave tossed by the sea, every argument had me convinced, but the question continued to haunt me. A quick look at the Greek revealed two different words that have been translated into English as “Covering;” Katakaluptatai, referring to a phsyical veil and Peribailou, referring to a woman’s hair. The woman’s hair is clearly her glory and it is given to her as a covering, (peribolaion). Why cover, (Katakaluptato), her glory, with a veil/scarf, when she prays or prophesies? In today’s culture we have rebelled against the very authority Paul is explaining to the first Century Corinthians, God appointed an order of authority. For a woman to shave her hair/her glory was equal in comparison to a woman who did not cover her hair/glory when she spoke with/praying to God and speaking God’s Words/prophesying. Both are examples of dishonor. “Because of the angels,” is a bit puzzling until we study the Hebrew word, Malak #4397. The Bible has stories of angels, (Malak) appearing in human form, as well as human messengers, (Malak) of God. Malak refers to both human and angelic messengers of God, Genesis 18:2; Genesis 19:11. It is for this reason a woman’s physical head covering was and is an observable Sign. This Sign sets her apart from the world and the women who do not acknowledge God’s order of authority. In other words, when a woman chooses to conceal her glory, her hair, humbly, modestly, under her husband, for him only, she is revering God. I was no where near understanding how God honors our obedience to His appointed authority. I adamantly disagreed with my husband as I began learning more about God’s Word and making some drastic changes in my life. I expected him to search and pray for God’s Spirit to lead us into all Truth, as fervently as I was. He didn’t like me changing and he wasn’t about to budge in defending his lifelong religious beliefs. I was confused and hurt by my husbands negative reaction when I first began wearing a scarf. How could my drawing closer to God cause us to be so irreconcilably opposed? But I knew divorce came from the hardness of our heart, Matthew 19:8. Years went by as I searched and waited for clarity. Then one day I came across my old favorite KJV Bible. It had footnotes and keywords in Greek and Hebrew, I opened it right to 1 Corinthians 11, and there in the footnotes I read, “head covering was regarding the blending of a Greek custom and a Jewish custom.” It dawned on me that Paul was telling the Corinthians to judge customs and Customs were not Commandments! I quickly interpreted this as my answer; Head covering was only a custom and it wasn’t the custom here in the U.S. I was elated, what a relief I didn’t have to worry about upsetting anyone anymore. I couldn’t wait to get to a quiet place so I could thank God for my answer. As I bowed my head to the ground, I was smiling and grateful, but my words were interrupted by a picture in my mind. My closet was dark and my eyes were closed so I was seeing the picture the same way I see a dream in my mind. I was facing a crowd of disproving people. I could see a crowd of faces and they were all glaring at me with disapproval and derision. I knew it was because I was wearing a scarf. There wasn’t a word, yet I could fill a page writing all my insights. Everything in me wanted to take off my scarf so the people wouldn’t be upset with me anymore. Then I realized God was facing the crowd with me but my desire was to please the crowd. My eyes welled with tears as I realized my desire to please people was greater than my desire to please God. That’s When I Knew Head Covering Pleased God! I caught my breath and jumped to my feet, grabbing a nearby scarf. I thought I had outgrown all those past insecurities, but my fear of disapproval, rejection and being misunderstood by people was caught in the flash of that picture. I put the scarf over my head and resolved to wear something everyday as a reminder to please Him above people from that moment on, Hebrews 11:6. The greatest test came that same day. I planned to go to the grocery store and later meet some girlfriends. Fear and insecurity surfaced as I put my scarf over my head before I left the house. I can still remember my first step outside. I knew my life was about to change and it felt like I was stepping off a cliff. There was no turning back, when I took that step it was like I was floating out the door. It was well over 100 degrees in Arizona and I was wearing my only rectangle shaped, (wool) Pashmina. I didn’t know how to wrap it, so I just draped the longer end over my opposite shoulder. Even now I smile at how I must have looked but I honestly forgot I was wearing a scarf until I saw my friends stunned expressions. Wearing a scarf has freed me from the oppression of the world, from my fear of what people think and my desire to please all my adversaries. I understand that my scarf is a Sign that I am obediently under God’s appointed order of authority. Yes, I am under my husbands authority. Amazingly, it was my humility that softened my husband’s heart, my need to be heard and understood never did. I would like to write a guest post on your website. Can you send me more information to waytoff [at] waytoff dot com. Cheers. I simply want to say I am just all new to blogging and absolutely enjoyed this web page. Very likely I’m going to bookmark your website . You really have beneficial articles. Cheers for sharing your web-site. This is really awesome. I will also write about the head covering in my Study Abroad blog. I will also mention you and my other friends who cover the head in the United States.